A marijuana user was found not guilty of drug charges—not because he didn't do what he was accused of, but because the jury disagreed with the law. Laurens County, GA – Javonnie Mondrea McCoy is a medical marijuana patient in a state where the plant is still illegal and was recently in court facing charges of possession and manufacturing. McCoy grew cannabis for his own personal consumption to treat severe headaches and other pain that he has suffered since he spent two weeks in a coma in 2003 after being severely beaten. Instead of attempting to fight the case on the grounds that the evidence against him was wrong, McCoy instead argued that the laws were wrong. He was honest about his experience and his medical use of cannabis during the trial, and the jury acquitted his case, despite the evidence against him. McCoy’s lawyer, Catherine Bernard, said that McCoy is not the type of person who belongs behind bars. “The jury appreciated his honesty throughout the case—including testimony at trial and statements to police—and recognized that a good, hardworking man living a quiet life and not bothering anyone didn’t deserve a felony conviction for his actions,” Bernard said. This is just the most recent case of a jury nullification victory for cannabis users, but this strategy is becoming increasingly popular. For those who do not know, jury nullification is basically the right for any juror to not only judge the facts of the case but to also actually judge the validity of the law itself. This means that if a jury feels that a defendant is facing an unjust charge, they actually have the right to rule in the defendant’s favor, even if they are technically guilty under the court’s standards. Considering the fact that most of the nonviolent offenses on the books today are extremely unpopular for a variety of reasons, you would think that jury nullification would be household knowledge, or even taught in schools. However, this is a very well guarded secret, with many judges actually preventing the defense from informing juries of their right to nullify laws that they feel are unjust. In fact, in 2016, New Hampshire House became the first state in the nation to consider a bill that would require courts to inform juries of their right to vote not guilty when the verdict would produce an unjust result. Attorney Catherine Bernard could not be immediately reached for comment, but posts on her Facebook page suggest that the judge attempted to block her from discussing jury nullification in court. “Today, I quoted Article 1, Section 1, Paragraph XI of the Georgia Constitution to the jury. The judge interrupted and told them it was ‘not a correct statement of the law.’ The judge took an oath to uphold that Constitution. What’s going on here?” Bernard wrote. 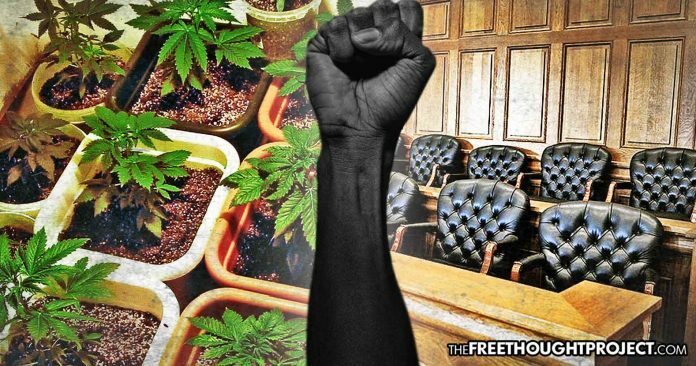 It is sadly common for judges to prevent talk of jury nullification in their courtrooms, as cannabis activist Ed Forchion, aka “NJ Weedman,” learned during one of his jury nullification victories. Forchion was passionate in the closing arguments of his 2012 trial, wearing a shirt that said “Marijuana … It’s OK. It’s Just Illegal,” and telling the jury that he had been munching on edibles throughout the whole trial. Then at one point, he was nearly held in contempt of court for trying to advance his jury nullification argument. In the years since Forcion has faced constant harassment from the authorities and has been arrested on numerous occasions. Luckily, he was still able to win over the jury earlier this year when he was found not guilty after spending over 400 days in jail on trumped-up witness tampering charges, which were related to a prior marijuana case.